In Cushman’s living room, gamers are squeezed together on couches amid TVs, a cluster of controllers, chargers, and discarded shoes. As the week’s Smash Club tournament is about to start, students snack on Kool-Aid and a member’s home-baked cookies while they unabashedly fight over who plays as Princess Zelda — evidently, a highly sought-after character in the video game Super Smash Bros. 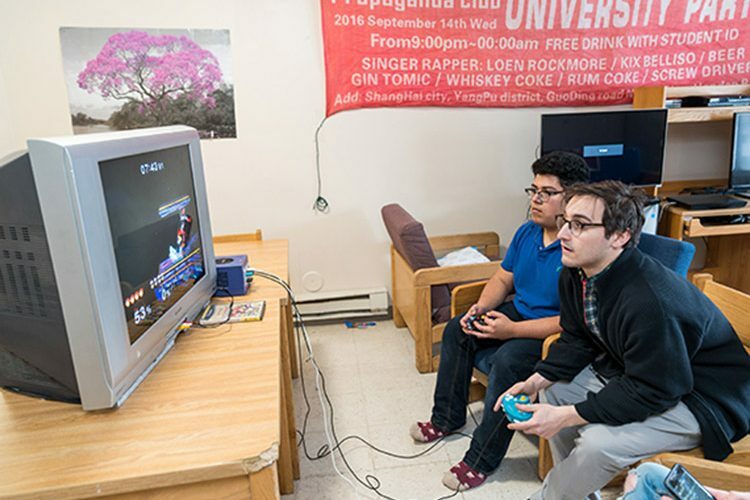 The Smash Club student group has come a long way since Jonathan Morales ’18 and Marc Maggiore ’18 discovered their mutual interest during their first year. In crowded dorm rooms, the two would spend hundreds of hours playing Smash — competing as various Nintendo characters keenly fighting to knock out Kirby, pull off ledge recoveries, or final smash Bowser off a perpetually moving spaceship stage. The rivalries between the players of West Hall as well as the precarious balance between sociable fun and intense competition defined these gatherings. Maggiore and Morales decided to start an official Smash Club because they wanted to create a space for true competition in the game. “We had a group of guys who regularly played, probably sixteen, and it started growing,” Maggiore says. Over the past three years, Morales and Maggiore have created, developed, and grown the student organization, which hosts bi-weekly tournaments for players to compete in both Super Smash Bros Melee and Super Smash Bros for the Wii U. With more than 70 active members, events featuring guest speakers, and larger tournaments with other schools including (on screen and off) rival Cornell, the Smash Club has leveled up in a major way. Smash is classified as an eSport, which entails professional players, teams, coaches, tournaments, and lucrative careers for top players due to merchandise deals, advertising on websites and livestreaming platforms, sponsorships, and prize money. With more than $50,000 up for grabs at major tournaments, wins are important, and players are serious about trying to catch ’em all. Tournaments — held anywhere from Donovan’s Pub to Hamilton Theater to open classrooms — allow players to compete for top rankings in the club. At these events, the cheerful tune of the game and camaraderie between the members are juxtaposed by hip-hop music and players’ concentrated expressions as soon as “Ready… Go!” flashes across the screen. They are suddenly engrossed in brawls on unknown galaxies and enchanted kingdoms. This virtual pastime is making a very real impact on campus. The group now has an executive board — known fondly by members as the “master core” — that helps plan events. Last fall, they brought Juan DeBiedma (known by his tag “hungrybox”), who was the number one Smash player in the world, to Colgate for four days. “That got our name out there so people know we have a Smash scene,” Morales says. Another of the club’s greatest successes happened recently when a play by Jacob Pilawa ’20 attracted more than 15,000 views on EvenMatchupGaming, the largest channel featuring weekly highlights. Moving forward, the club hopes to bring in more speakers and acquire funding for top players to compete in a national collegiate Smash tournament. As Morales and Maggiore prepare for graduation, they hope to pass the controller to eager, up-and-coming members. The club, they say, was the defining component of both their education and friendship. “We’ve become best friends over the course of our time here,” Maggiore says. Explore other Colgate student clubs here.